DISCOUNTS FROM MONDAY MAY 27TH THROUGH SATURDAY JUNE 8TH, 2019 AND FROM SUNDAY JUNE 16TH THROUGH SATURDAY JUNE 22ND, 2019. BOOK TODAY TO RECEIVE OUTSTANDING VALUES! I ONLY MANAGE TWO UNITS IN THE COMPLEX AND MY WEEKLY RENTALS ARE SUNDAY TO SUNDAY DURING PEAK SUMMER MONTHS. PLEASE CHECK MY WEBSITE CALENDAR FOR AVAILABILITY OR EMAIL CONCERNING RATES AND AVAILABILITY. . Please consider our 1 BR GARDEN LEVEL LAKE FACING CORNER UNIT that is also available at this complex(VRBO #100633)!! Asher Premier Beachfront Condo is my two bedroom modern, 900+ sq. ft. TOP FLOOR CORNER unit on Lake Michigan. This LAKE FACING unit is fully furnished and comfortably sleeps six adults with a king-size bed, 2 twin beds and a pullout couch. All appliances has been recently replaced and the kitchen redecorated! This condo is considered to have one of the best Coastline views in the complex and maybe the whole town!! The unit is both poolside and beachside and it features unbeatable sunsets and coastal views while sitting within the unit. The private pool is just steps away from your bed and the private beach. The complex is next to a city Park which allows superior coastline views and just a short walk from the quaint downtown of South Haven where there are plenty of shops and great little restaurants. Also, please consider renting our Asher Premier Beachfront 1 BR LAKE FACING CORNER unit with great views as well in the same building @ VRBO #100633 and also consider our my Golf property(4 miles from Gulf of Mexico) in Naples, Florida at VRBO #378357. I had the great fortune of being born and raised in South Haven. As a kid, I thought this small town was too slow for my likening especially during the long, snowy winters. As I matured, I realized how lucky I was to have experienced the lifestyle of this community. I remember participating in the clubs and sports the community had to offer, enjoying the Blueberry Festival and Fourth of July events. Some of my favorite activities were water skiing or fishing on Lake Michigan and snow skiing at nearby Timber Ridge. We have cooked blueberry pancakes for breakfast on the beach during the summer and climbed the ice bergs in the winter. I have brought my wife and kids back for the past Thirty plus years. My kids have experienced the joys of the town throughout their life and I know they will continue the traditions with their children. I hope that you can feel a small piece of what joys this town has given to me during your week vacationing in South Haven!! We have admired this property over the years when we took our kids to the public beach at Packard Park. My wife always said “that is the place we should find a unit in”. It has so much to offer with it’s own private beach and pool. The terrace is huge and is great for entertaining or eating your dinner while watching the sunset. This dream continued for many, many years until we purchased our 1 BR unit in 2005 and added this 2 BR unit in 2013. We love our units since they face the lake and they are so comfortable to sit and read. We love sleeping with the window open and hearing the waves crash on the shore. It is great just walking out the door onto the beach for a stroll to the North Pier. The location of the unit and the size of the town allows you to walk into town for shopping or meals. Go try the onion rings of Clementine’s or the bucket of perch at the Thirsty Perch in town. You must go to Captain Nemos for ice cream and don’t forget about the Golden Brown and Bunde's Bakeries. Once there I am sure you will agree that it’s great having a pool and being on the lake at the same time and that you will want to return year after year to realize life’s simple pleasures!!! Master bathroom has jet tub and shower. The unit overlooks the wide, flat private beach. You are just steps away from the private, heated pool and beach. 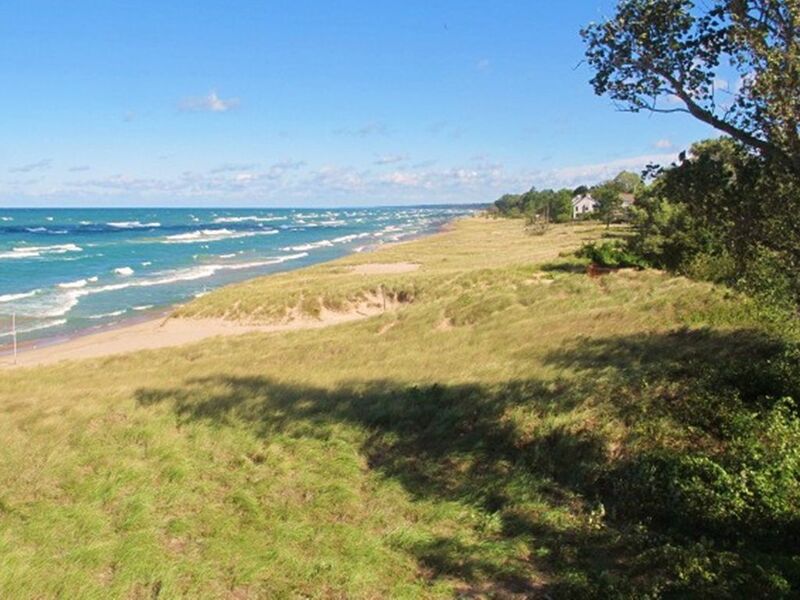 The unit overlooks the private beach and Lake Michigan and has spectacular coastline views!! The unit boast the best coastline views in the city and there is a pool and large deck right on the wide beach. The complex is right on the beaches of South Haven and the corner condo unit faces the lake. The complex is right on the beaches of South Haven and the condo faces the lake. AC unit is dining area and master bedroom and several ceiling fans. There are coin operated machines on the Garden Level of the building. Private parking lot with assigned spot during the peak summer months and open parking during the rest of the year. .
Gas stove & oven was replaced in October 2015 and it allows perfect control for cooking!! BUT why cook when you are on vacation!! December 2015 Kitchen was redecorated with granite counter top and subway tile backsplash for a beautiful updated appearance! Comfortable seating & spectacular views!! There is no elevator available in this complex. Access to the condo from parking lot side requires 25 stairs. Access from the condo to the pool requires 40 stairs. Heated private pool available for complex from Memorial Day weekend and into early September(weather dependent). Fantastic for when the Lake is cool! Please bring your own BEACH TOWELS! !